I was rather upset to see a journalist write rather disparagingly about the I-Spy series of books as ‘patronising.’ Personally I was delighted to hear that they had been relaunched by Michelin. The fact is, in this information-laden world of ours, the value of pocket-sized guides could not be greater. 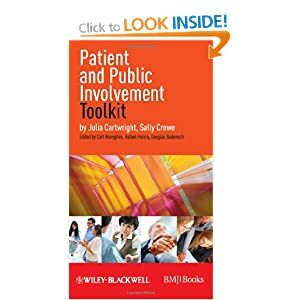 So I was delighted to recently receive in the post, a copy of the ‘Patient and Public Involvement Toolkit’ written by my good colleague Sally Crowe, and Julia Cartwright. And it is pocket-sized! I’ve been carrying it round for days now and dipping into it regularly. Sally and Julia’s wealth of knowledge shines through in this book which deals with PPI across health care. It is full of sound, practical advice packaged in easy bite-size chunks for people like me who have short attention spans.